Nomad Distribution Pimiento de Padron ( Padron peppers ) are grown in the hills district, NSW, with harvest from Late October through to March. The most famous produce of Padrón are its peppers (Spanish pimientos de Padrón), which are small green peppers from the Capsicum annuum family. 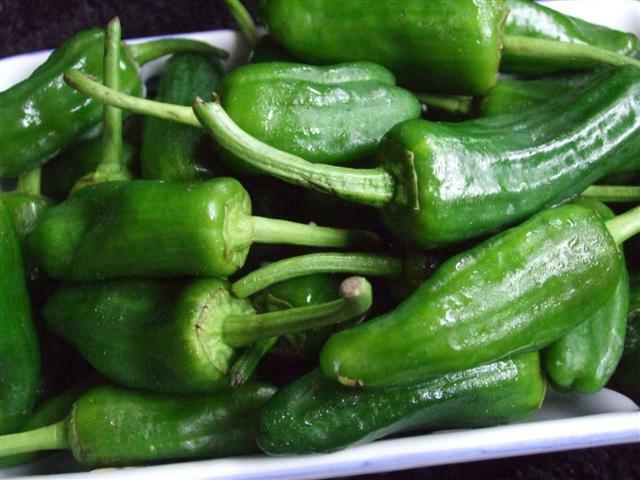 The most famous produce from Padrón in Spain are its peppers, (Pimientos del Padron). They are small green peppers that are served fried in olive oil and sprinkled with sea salt. Most are sweet and mild, though a few devils are particularly hot. In Spain you will find next to the Padrons on the menu this saying: "Os pementos de Padrón, uns pican e outros non" it is a Galician saying: ("Padrón peppers, some are hot and some are not"). In 1979 a popular fiesta was been held to celebrate this great Padron peppers, every year since, the first Sunday in August Spain celebrates the delights of this fantastic little green gem.The fiesta takes place in the carballeira of Herbón's Franciscan convent, since it was the Franciscan monks who brought the first pepper seeds from Mexico in the 16th century,which were then adapted to the soil and the climate of this Spanish region. Padron uns pican e outros non.